Tongal also serves as a crowdsourcing platform, where brands can tap into countless ideas. Its methodology enables creative in the platform to make a contribution at any point between ideation and production. This allows them to showcase their talents while the companies utilizing Tongal gain more creative insights. With Tongal, brands receive ideas no matter what kind of creative project they have. With over 120,000 creatives, brands working with Tongal get proposals on advertising and branded content, original content, and PR & editorial content. This makes the platform an all-rounder for creative projects. Tongal is a network of more than 120,000 creatives–writers, directors, and production companies. This means that brands are tapping into a broad expanse of people who are able to offer varying ideas for every stage of the project. This way, companies have numerous options to choose from. Sponsors and brands receive ideas from anyone in the network. The number of submissions may be limited, but they still have a huge pool of contributions to choose from in every phase of the project. Tongal allows sponsors to purchase more submissions if they wish. This enables more content creators to offer their own takes on a project and also gives companies more ideas to choose from and work with. 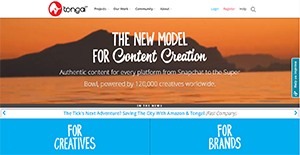 Tongal has been employed by various Fortune 500 companies to create original content for them. This makes the platform a premium one, with professionals who deliver awesome work that attract big brands. This only serves as a testament that the platform is an exceptional one with extraordinary creative minds. When brands first begin working with Tongal’s creatives, they are required to post a brief. This enables community members to tailor their submissions according to the brand’s requirements. With this, sponsors receive contributions that are in line with their branding. If you are interested in Tongal it may also be beneficial to examine other subcategories of Best Freelance Platforms collected in our base of SaaS software reviews. It's crucial to realize that hardly any service in the Freelance Platforms category is an ideal solution that can fulfill all the goals of all company types, sizes and industries. It may be a good idea to read a few Tongal reviews first as certain services may perform well exclusively in a very narrow set of applications or be prepared with a very specific type of industry in mind. Others can operate with an idea of being easy and intuitive and therefore lack complicated features desired by more experienced users. There are also apps that cater to a broad group of customers and give you a rich feature base, but this in most cases comes at a higher cost of such a solution. Be certain that you're aware of your requirements so that you buy a service that provides exactly the functionalities you search for. How Much Does Tongal Cost? We realize that when you make a decision to buy Freelance Platforms it’s important not only to see how experts evaluate it in their reviews, but also to find out if the real people and companies that buy it are actually satisfied with the product. That’s why we’ve created our behavior-based Customer Satisfaction Algorithm™ that gathers customer reviews, comments and Tongal reviews across a wide range of social media sites. The data is then presented in an easy to digest form showing how many people had positive and negative experience with Tongal. With that information at hand you should be equipped to make an informed buying decision that you won’t regret. What are Tongal pricing details? What integrations are available for Tongal? If you need more information about Tongal or you simply have a question let us know what you need and we’ll forward your request directly to the vendor.